2 way solenoid valve 120V. Hair pin locks not included. The purpose of this solenoid valve is to control the steam flow from the steam boiler to the steam tube in the front of the machine. 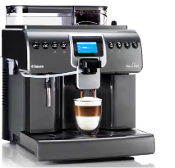 Suitable for Jura Capresso espresso machines: F9 - S7 Avantgarde - S9 Avantgarde - C9 - C1300 - GIGA 5 - GIGA X7 - ENA 9 One Touch - XS90 & Krups models. This solenoid valve can also be used in older Capresso C3000 and S8 models. However, the teflon tubes needs to be purchased for conversion from old valve to new. The new solenoid valve uses the hair pin connection for teflon tubes. The older solenoid valve used legris connector 1/8 4mm. Also, the old solenoid valve is no longer available. If your S8 or Capresso C3000 has non-functioning solenoid valve then you will need to purchase the conversion kit, see item 0010529.